“You have to go to The Office” proclaimed a gentleman at our vacation villa’s swim up pool bar. “We’ve been coming to Cabo for 10 years and this place is awesome”. 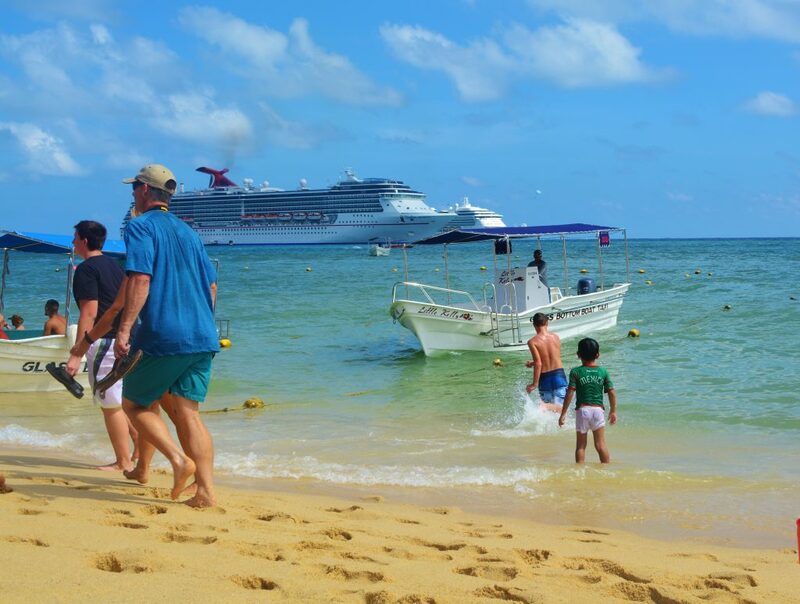 We were vacationing with family in Cabo San Lucas, one of Mexico’s top five travel destinations. 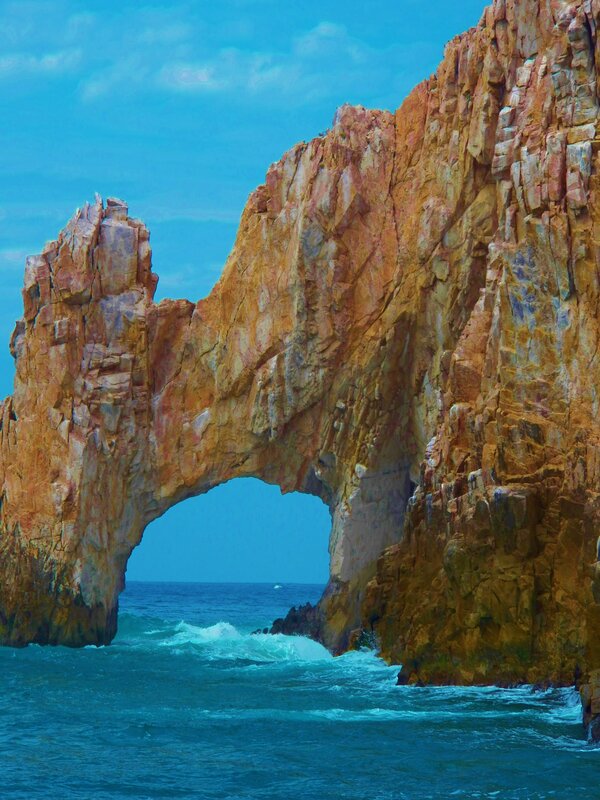 Located on the tip of the 800-mile long Baja California Peninsula, where the Sea of Cortez meets the Pacific Ocean at the famous El Arco (Lands End Arch), Cabo is known for its great weather, gorgeous beaches and spectacular scenery. 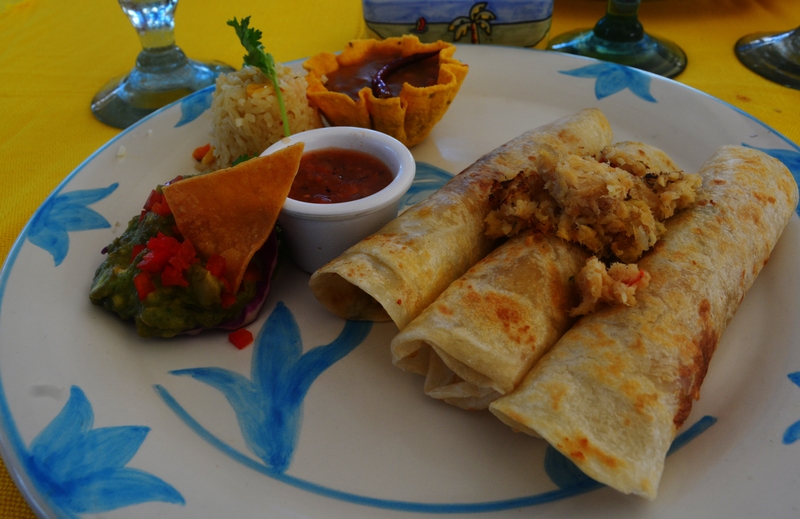 But, Cabo’s also renowned for its Baja cuisine- especially its delectable seafood. 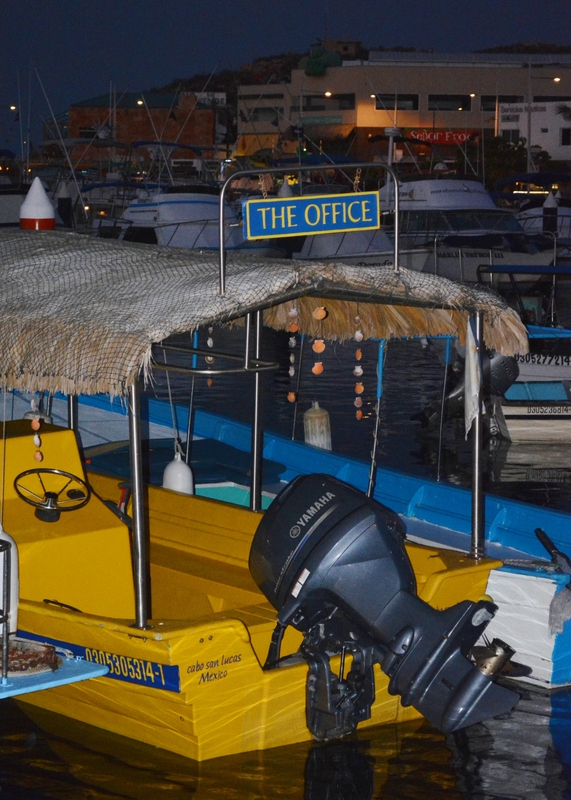 On this, our fourth trip to Cabo, we finally made it to what’s known as “The Office.” To be perfectly honest, even after the recommendation, we had avoided dining here as we thought the restaurant’s kitschy name marketed heavily to the workaholic American tourist. Gosh, were we ever wrong. The Office is located in the heart of Medano Beach, one of Cabo’s most popular beaches known for its crystal clear, aquamarine swimmable waters, and soft sandy beach. The two mile stretch of deep golden sand is studded with some of Cabo’s top resorts, restaurants and nightclubs. Day or night, Medano Beach rocks the ultimate beach party. As a result, the food establishments here are more known for their inexpensive alcoholic beverages than great cuisine. We happened to find ourselves on Medano Beach, a prime area for water adventure sports, making arrangements for a panga (small boat) to take us to the iconic El Arco for a snorkeling adventure. And there it was – The Office. Passing by The Office beachfront, we couldn’t help but notice patrons sipping margaritas under palapas and umbrella tables covered with multi-hued tablecloths- toes in the sand, all having a great time. 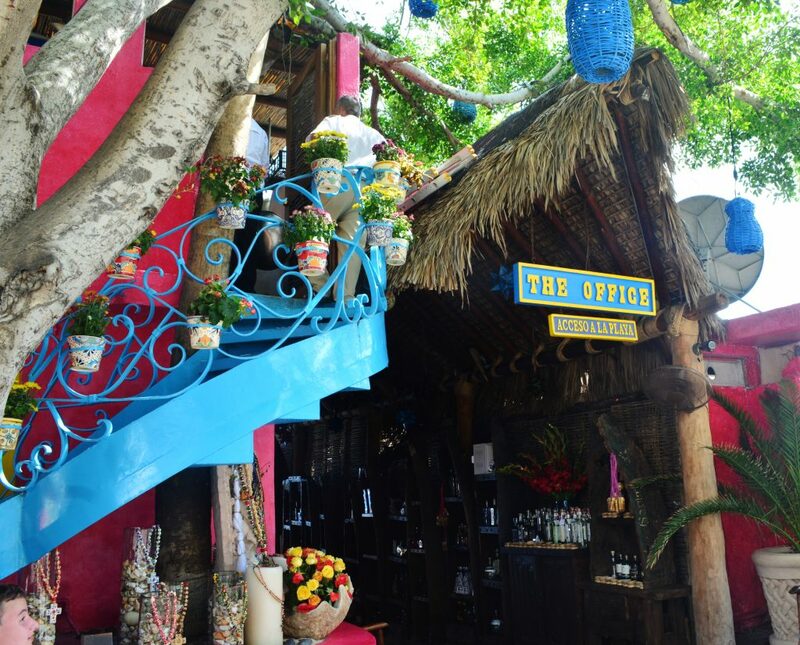 The aromas of freshly grilled meats and seafood wafting through the air lured us to its colorful open air entrance. Today, we all agreed, was the perfect day to try this place out and see what these rave reviews were all about. The host greeted us with a warm smile and “Buenos Dias” upon entering the restaurant. Our group of five was quickly seated in an umbrella table facing the ocean. Drink orders were taken by an attentive young man who told us our waiter would be there shortly to answer questions about the menu. Freshly made salsas and guacamole accompanied with homemade tortilla chips fresh from the oven appeared tableside within a few short minutes. When Juan, our waiter arrived, he was friendly, engaging, with a big smile and a keen sense of humor as he explained the fresh fish entrées of the day. He had expert knowledge of the menu and confidently made entrée recommendations. Employed there for almost twenty years, he proudly shared some of the history of The Office. He even pointed out The Office has its own boat, anchored right off shore, that provides guest transportation to Cabo’s famous Lands End Arch. Waiting for our entrees to arrive, we marveled at the stunning ocean views and location, perfect for people watching. Treated to what we termed our “Mexican fiesta”- mariachi players strolled through the restaurant playing lively songs, then, returned to a stage to entertain guests with popular Mexican music and piñata games with prizes, including free tequila shooters. The highlight of our visit to The Office hands down was the fresh tasting, savory, beautifully presented food entrees. Our shared appetizer, a tender, fresh Acapulco style Fish and Shrimp Ceviche marinated in lemon juice, salt, pepper, and a myriad of vegetables with spices and white wine was delectable, accompanied by cold Mexican beer with lime. 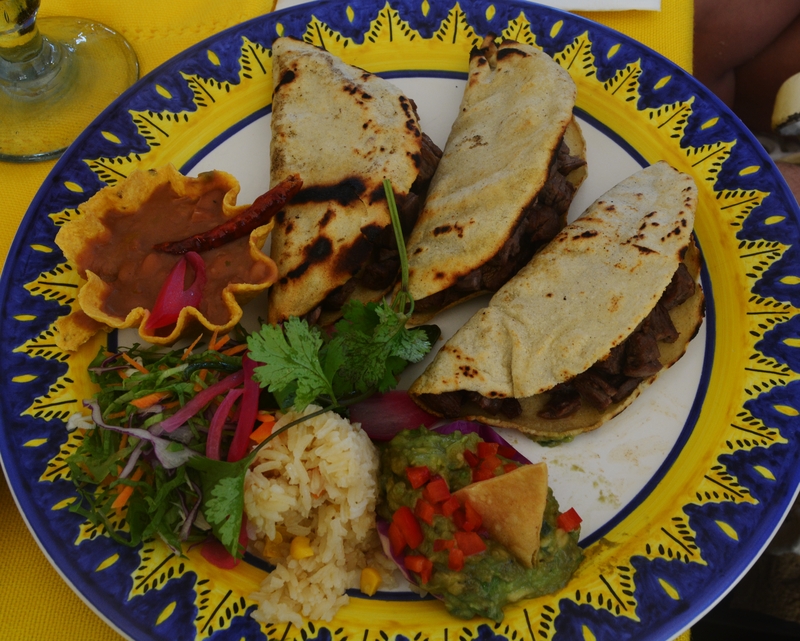 Described on the menu as a Mexican Delight, the Beef, Chicken and Shrimp Fajitas sautéed with onions, tomato and green poblano peppers tantalized the taste buds. 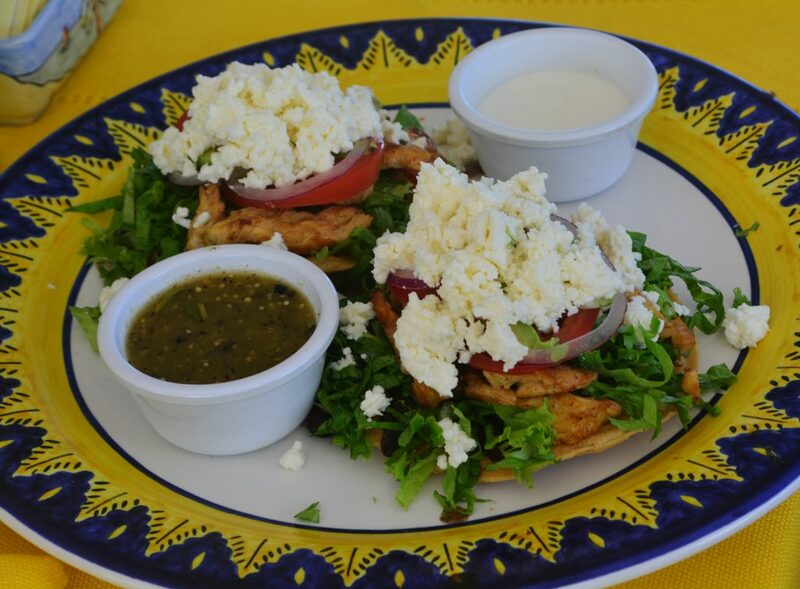 Chicken Tostadas, prepared with grilled chicken breast, black beans, lettuce, tomatoes, red onions, avocado, sour cream and an exquisite queso fresco crumbled cheese absolutely melted in our mouth. Grilled Flank Steak Tacos were a perfect blend of Mexican spices infused into tender pieces of locally raised Black Angus beef. It was literally impossible to agree on our favorites. And sharing a few bites of each dish made it all the more fun. Though Medano Beach has numerous restaurants and cantinas all along the beachfront, there is no denying that The Office is THE beachfront place to dine. The setting, with its incredible Sea of Cortez views and perfect people watching locale definitely sets the stage for a memorable visit. But, in the end, what The Office delivers is unsurpassed customer service with delectable cuisine that knocks it out of the ballpark. The gentleman at our resort couldn’t have been more right. This place is indeed awesome! Noreen L. Kompanik is a registered nurse and freelance writer and photographer based in San Diego, California. Fortunate to have lived overseas as a Naval Officer’s wife, she has traveled extensively and her many Italian and other European adventures have sparked her passion for cooking and wine tasting. 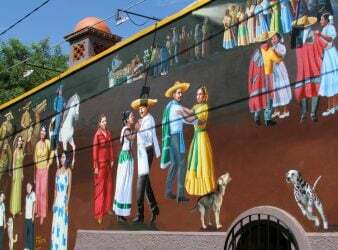 A member of the International Travel Writers and Photographers Association, Noreen is a frequent contributor to several online and print publications. 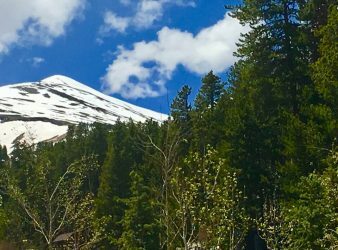 She shares her latest adventures, photos, and published stories on her What’s In Your Suitcase? Facebook page. Her stories reflect her love for travel, history, adventure and family. Noreen! My favorite type of food just sounds even better here. Another one for the bucket list. Sign me up for that Office! The food looks and sounds great.